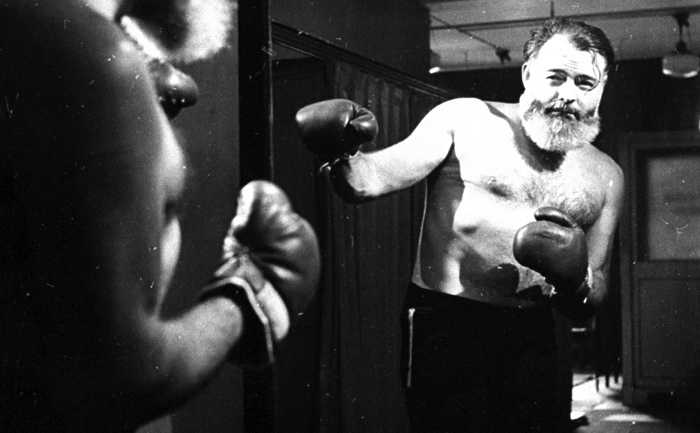 Ernest Hemingway referenced boxing from time to time in his writing. But one of his works was devoted entirely to the sweet science. Hemingway’s great novels were far in the future when he wrote “Fifty Grand.” He was a 27-year-old journalist and short story writer. The Atlantic Monthly published the 8,000-word piece in 1927. The odds are 2-to-1 against Brennan on the eve of his title defense at Madison Square Garden against challenger Jimmy Walcott. Two nights before the fight, Brennan tells Doyle that he has bet $50,000 on Walcott. The fight itself is dramatically told, as one would expect. After all, this is Ernest Hemingway. Brennan controls the early rounds with his jab. By the middle rounds, Walcott is dominating the fight. Jack’s left arm is getting heavy. His strength is gone. His legs have deserted him. He’s taking a terrible beating, especially to the body. All he wants now is to avoid the indignity of a knockout, finish on his feet, and collect his purse plus the $25,000 profit on his bet. Then the plot becomes a bit contrived. Now the dilemma. If Jack collapses from the low blow, he’ll win by disqualification and be $75,000 poorer than if he’d lost. He struggles to maintain his feet and assures the referee that he can continue. “Come on and fight,” Jack says to Walcott. The referee waves Walcott in. Walcott has been unable to rise and thus been declared the winner by disqualification. Did he have a fix of his own in mind when he deliberately went low on Jack? From Hemingway’s point on view, that’s secondary to the belief that Jack Brennan fought like a champion by continuing to fight after the low blow even though his goal was to deliberately lose. But Hemingway didn’t just write about boxing. He considered himself a boxer. How good was he? Not very. Hemingway’s most notable ring encounter came at The American Club in Paris in 1925 when he sparred against a Canadian writer named Morley Callaghan. The two men had squared off on several previous occasions. Callaghan, in an account corroborated by third parties who were present, wrote about the experience in a book entitled That Summer in Paris. The Canadian was more competitive for the rest of that first sparring session. Hemingway and Callaghan sparred together several times thereafter. Their final sparring session was particularly intense. The fly in the ointment was that F. Scott Fitzgerald, who was serving as timekeeper, had become so engrossed in the proceedings that he’d let the round run a minute long. Hemingway reportedly never spoke to Fitzgerald again. Who else did Hemingway spar with? Well, at least one man wouldn’t spar with him. Thomas Hauser can be reached by email at thauser@rcn.com. His most recent book – There Will Always Be Boxing – was published by the University of Arkansas Press. In 2004, the Boxing Writers Association of America honored Hauser with the Nat Fleischer Award for career excellence in boxing journalism. One of the best boxing history books that I have ever read has been around since 2005 and I just stumbled on it. 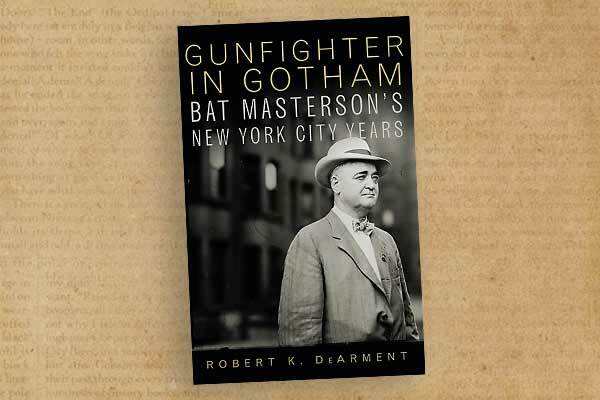 You wouldn’t guess from the title but Robert K. DeArment’s “Broadway Bat: Gunfighter in Gotham” is a book that ought to be on the bookshelf of every serious boxing history buff. DeArment, a World War II veteran, is recognized as one of America’s leading authorities on life in the Old West, in particular the lives of famous lawmen and outlaws. His 1979 book, “Bat Masterson: The Man and the Legend” (University of Oklahoma Press) is considered one of the best books of the genre. At various times, Bat Masterson was a County Sheriff and U.S. Marshall in several western hot spots, most famously Dodge City, Kansas, where his legend was born. Dodge City back then, circa 1875, was a wild and wooly town where cattlemen brought their herds and then sowed their wild oats like sailors on shore leave. When Bat said “get out of Dodge,” he did it while pointing his trusty six-shooter at the miscreant. In truth, however, during his days out west Masterson occupied more of his time as a professional gambler than a peace officer. He ran gambling saloons, invested many hours at faro and poker, and backed other professional gamblers. DeArment’s 1979 book debunked many of the myths about Bat Masterson that were set down in magazine articles and in books aimed at young readers. Bat Masterson’s life had a second act and the second act could not have been more different than the first. He lived the last 19 years of his life in New York City, spending the first four of those years residing with his wife, a former chorus girl, in a Times Square hotel. He hired on as a sports columnist for The New York Morning Telegraph, rose to the position of sports editor, and had the added duty of handling the accounts of racing tipsters who comprised a good portion of the paper’s advertisers. The Morning Telegraph, the third oldest daily in New York when it folded in 1972, was part Daily Racing Form, part Variety, part Wall Street Journal, and part scandal sheet. Clergymen denounced the paper from their pulpits which, if anything, was a circulation-booster. Several notable journalists (e.g. Heywood Broun, Louella Parsons) earned theirs spurs at the Morning Telegraph but Masterson never left. He died at his desk in 1921 at age 67. Masterson cranked out three columns a week that eventually appeared under the heading “Masterson’s Views on Timely Topics.” He had the freedom to write whatever struck his fancy but his forte was boxing, a sport with which he was associated before he arrived in New York. He didn’t like baseball or collegiate sports and had no interest in the new sport of auto racing. As for thoroughbred horse racing, he tended to ignore the subject except during his yearly pilgrimages to Saratoga and Hot Springs. He was particularly fond of Hot Springs, a wide-open town in Arkansas until the reformers clamped down on gambling. This was in character as Masterson detested reformers in general. He viewed the self-appointed guardians of public virtue as mischief-makers who created more problems than they solved. In a column about boxing he might digress to take a swipe at the famous evangelist Billy Sunday or at a well-known feminist stumping for the right to vote. After a convention of suffragettes left Saratoga’s United States Hotel, Bat wrote that the hotel had to be thoroughly fumigated. Masterson thought the fighters of his day were inferior to their antecedents, an opinion that hardened during the White Hope craze. Although Bat was no fan of Jack Johnson the man, he came to Johnson’s defense when Johnson was found guilty of violating the Mann Act, forcefully expressing the very unpopular opinion that Johnson was railroaded. He came down hard on the New York boxing commission when it banned interracial fights in 1913, likely hastening the fast turnabout; the edict was lifted in 1916. But Bat, like many of his fellow scribes, was guilty of using racial and ethnic epithets in his columns. Masterson refused to join the Sporting Writers’ Association of Greater New York which was probably a good thing as his presence at its get-togethers would have discomfited a lot of the members. Although he didn’t name names, he was forever using his poison pen to barb boxing writers that took money from promoters and managers in return for favorable write-ups, a practice that was rampant in his day. Masterson bet big on Willard. For all his knowledge of the Sweet Science, he was a terrible handicapper, going back to the days of John L. Sullivan. He allowed his personal opinion of a fighter’s character to cloud his judgment. Masterson’s best friend in New York was Damon Runyon who would immortalize him as the Sky Masterson character in “Guys and Dolls.” Runyon took money from boxing promoter Tex Rickard, but Masterson was fond of both and looked the other way. Likewise, he never railed against the racing tipster industry. As has always been true, those that marketed their product most aggressively were running a scam, but their advertising dollars helped keep his paper afloat. Masterson’s protégé, Sam Taub, succeeded him as the Morning Telegraph sports editor. Taub went on to achieve fame as a blow-by-blow man on radio, calling an estimated 1700 fights. In 1982, the Boxing Writers Association of America created the Sam Taub Award to recognize excellence in boxing journalism. Twelve years later, Taub was inducted into the International Boxing Hall of Fame. Perhaps Bat Masterson will join him there some day. “Broadway Bat: Gunfighter in Gotham,” was released in 2005 by a publishing house in Hawaii that specialized in Western Americana and reissued in 2013 under a slightly different title (as shown in the graphic accompanying this story) by the University of Oklahoma Press. The book, copiously footnoted, has 30 pages of illustrations. It’s a fun read and essential reading for serious students of the sweet science. John Jarrett has been writing about boxing since 1951 when his first article, a piece about Rocky Marciano, was published in Boxing News. Since then, he has been involved with the sweet science in myriad ways including ongoing service as Northern Area Secretary for the British Boxing Board of Control for forty years. During that time, he has written nine books, he most recent of which (Rocky Marciano published by Pitch Publishing) brings Jarrett back to his creative roots. All biographies of Marciano are written in the shadow of Russell Sullivan’s definitive work, Rocky Marciano: The Rock of His Times (University of Illinois Press, 2002). But Marciano is a subject who continues to inspire writers to write. Jarrett offers an extensive recounting of Marciano’s ring career. There’s a particularly good retelling of the September 23, 1952, fight between Marciano and Jersey Joe Walcott when Marciano, trailing on all three scorecards at the start of round thirteen, seized the heavyweight throne with a highlight-reel knockout. In truth, the historical record developed by Sullivan and others suggests that Marciano was more interested in whoring around than in being a good husband and father. That said; Jarrett’s writing flows nicely and he’s passionate about his subject. 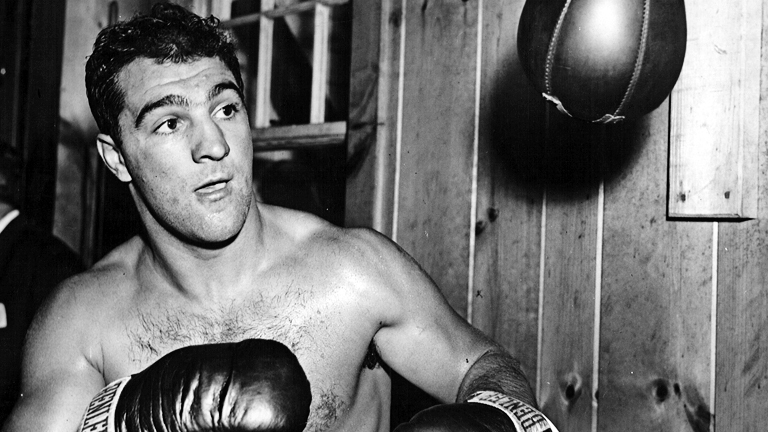 Fans of Rocky Marciano will enjoy the book. Never Stop by Simba Sana (Bolden Books) isn’t a boxing book. It’s a coming-of-age memoir written by a man who grew up in inner-city poverty, escaped, and then had to navigate the world outside it. But boxing keeps popping up in his life. Changing names to protect privacy is understandable. And memory is what it is. The phrase “creative fiction” might leave readers a bit wary. As Sana (then named Bernard Sutton) moved through adolescence, he trained at several boxing gyms and developed an affinity for the sweet science. Later, he earned master’s degrees from Howard University and St. John’s College and moved into the corporate world. The most intriguing portion of Never Stop insofar as boxing is concerned deals with the period of time that Sana managed Beethaeven Scottland. During his sojourn through various gyms, Sana had established a rapport with Scottland. By 1997, “Bee” had fallen out with his manager and walked away from boxing with an 11-4-2 record. In 1998, Simba began managing him on a handshake agreement. Scottland won his first fight back and, by late-2000, had a 20-6-2 record. Meanwhile, Sana was roughly $5,000 in the hole, not having cut Bee’s purses for most fights and having advanced the money for various expenses. In November 2000, Scottland dumped him. It hurt. That’s impressive honesty given what soon turned Sana’s “sense of satisfaction” to concern. Scottland was carried from the ring on a stretcher and died six days later. Never Stop is a good book. The Biblical battle of David vs. Goliath has endured for thousands of years as an inspiration for underdogs in one-on-one combat. But few people have written of that storied confrontation in a more intriguing fashion than Malcolm Gladwell. Gladwell authored a collection of essays published under the title David and Goliath (Little Brown and Company). The book examines nine individuals from various disciplines who battled powerful forces in contemporary times. The introduction to the book explores the original David vs. Goliath. Three thousand years ago, the Bible tells us, an army of Philistines was seeking to militarily divide the Kingdom of Israel into two parts which would then be vulnerable to conquest. The warring armies faced each other from opposite sides of a ravine. Neither army dared attack since doing so would require descending into the ravine and being assaulted from above. But David was insistent. You know the rest. At least, you think you do. Or phrased differently, in Gladwell’s eyes, David vs. Golaith wasn’t an evenly-matched fight. 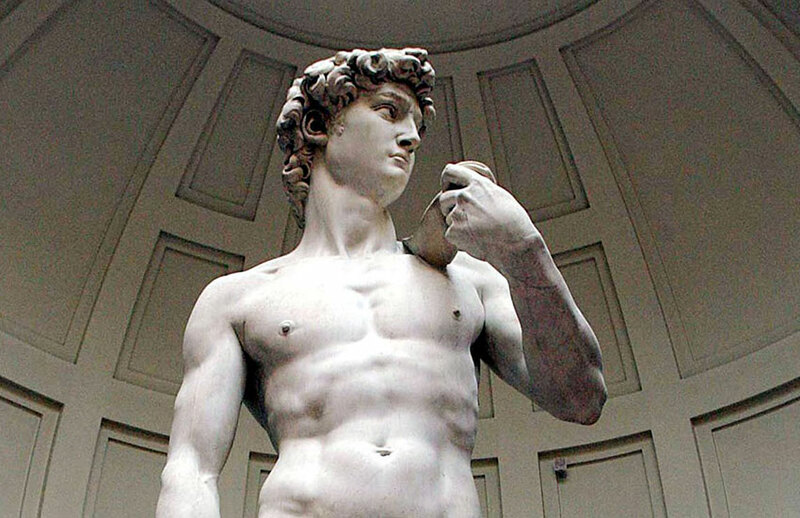 David had several crucial advantages. All David had was a shepherd’s staff, a sling, and five smooth stones. Not so fast, big guy. Now for Gladwell’s keys to victory. Moreover, in many respects, Goliath seems to have been like an aging boxer past his prime. “What the Israelites saw, from high on the ridge,” Gladwell concludes, “was an intimidating giant. There is an important lesson in that for battles with all kinds of giants. The powerful and the strong are not al­ways what they seem. If you think David went in tough . . .
One man fought both Jack Dempsey and Joe Louis. And the loser was . . . Jack Sharkey. On July 21, 1927, in the next-to-last fight of Dempsey’s storied ring career, the Manassa Mauler knocked out Sharkey at Yankee Stadium in the seventh round. Five years later, Sharkey won a split decision over Max Schmeling to claim the heavyweight throne. But a year after that, he lost the crown by knockout to Primo Carnera. Fast-forward to August 18, 1936, when Sharkey had the misfortune to enter the ring against Louis. It was the Brown Bomber’s first fight after suffering a devastating knockout defeat at the hands of Schmeling. The feeling was that Louis still might not be right. The feeling was wrong. He KO’d Sharkey in the third round.